1. Download and install OBS Studio by visiting the www.obsproject.com website. OBS is a free and open source software but glady accepts donations from those who enjoy the platform they provide. Once installed and launched, click on the "Settings" button as shown below. 2. From the left menu, click the "Stream" tab and fill in the URL and Stream Key fields. 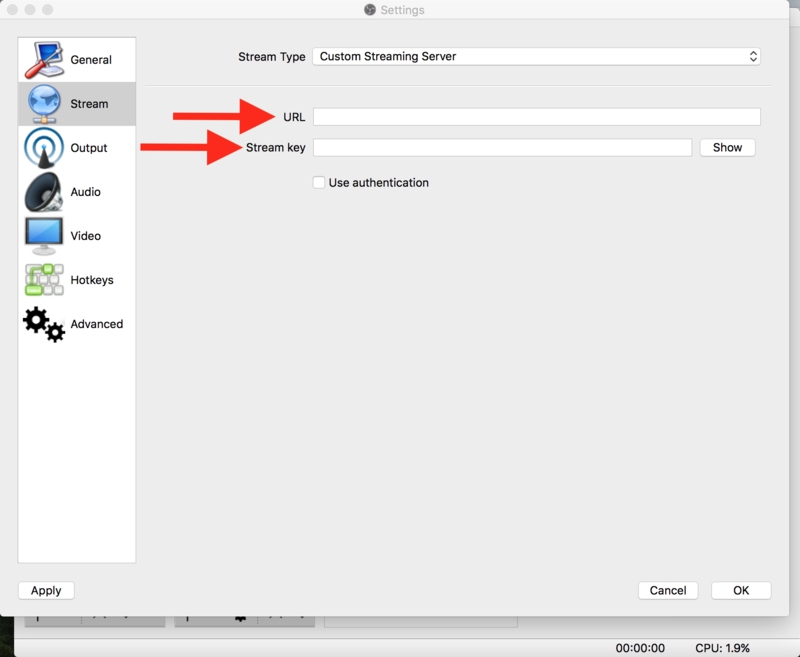 You can find your URL and Stream Key by logging into your CWM account and visiting the "Stream Settings" page. Look for the "FMS URL" and "STREAM" values and copy & paste them into the OBS fields. 3. From the left menu, click the "Output" tab and choose "Advanced" from the Output Mode drop down option. Change Rate Control to "CBR". Change the bit rate to correspond to about half of your available upload speed but no more than 2000 kbps (2 Mbps), or no higher than the limit on your CWM plan. You can determine your upload speed by visiting www.testmy.net/upload and running an upload speed test. When your results are returned, multiply it by 1000. For example, if your upload speed result is 4 Mbps (4 x 1000 = 4000 kbps), configure OBS to use 2000 kbps which is half of your available upload speed. Lastly, change the Keyframe interval to 2 seconds. 4. 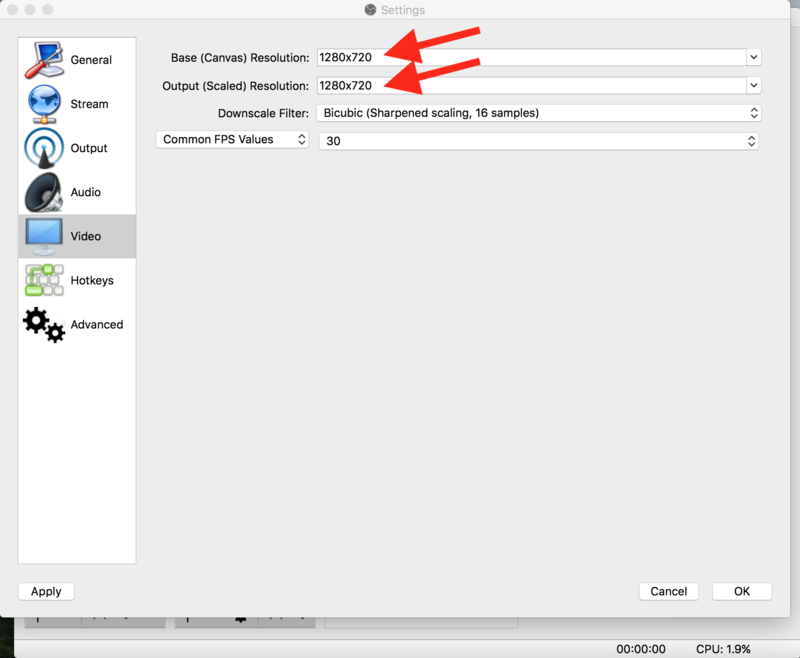 From the left menu, click on the "Video" tab and change the Base and Output resolutions sizes to 1280x720. If your camera outputs to a lower resolution then change these to match your camera instead. 5. Make sure your video capture device is plugged in and powered on. 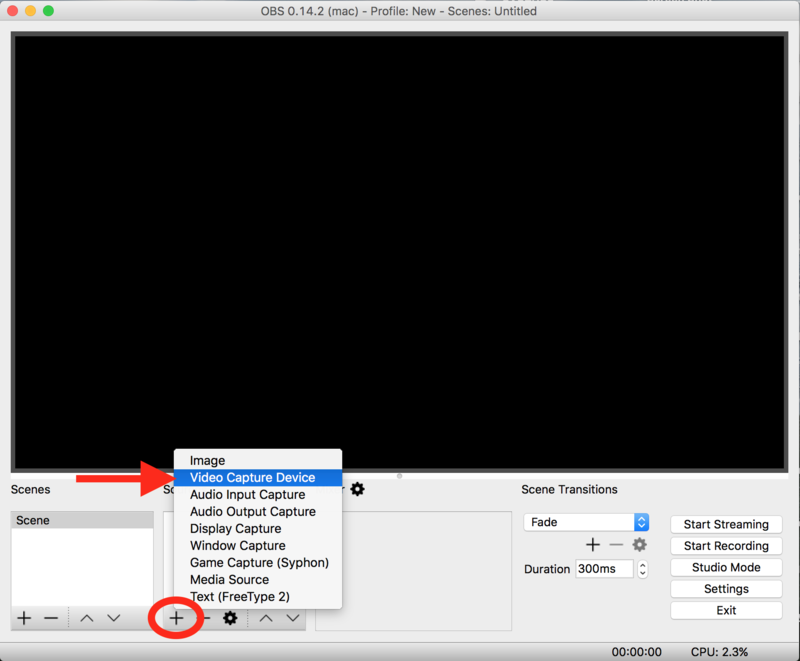 Click the "+" icon located beneath the Source box as shown below and choose "Video Capture Device". 6. Select your video input device from the drop down and press OK.
7. 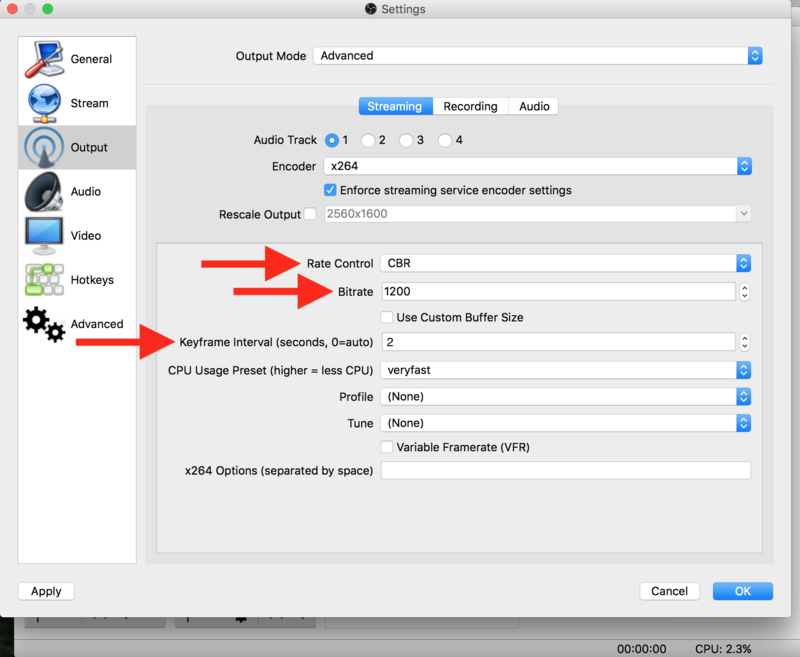 You should now see and hear your video and audio from your input device. You can now live stream by clicking the "Start Streaming" button. For more information about tools and features provided by OBS, visit the OBS forum. If you're having trouble setting up OBS with the steps provided here, email CWM support by clicking here.